Delta Airlines operates Airbus A321 during short and medium-haul flights inside the USA. This airplane may accommodate 192 passengers in three classes: first, economy and delta comfort plus. First class offers 20 reclining seats that are located in the first 5 rows per 4 seats in each. All these seats are standard only close location to the galley and lavatory may cause discomfort to passengers of the seats of the 1st row. The next 5 rows, i.e. the rows 10-14 contain seats of delta comfort plus class. First 3 rows of seats have 3-3 configuration. Because of the position of the bulkhead the seats of the 10th row have limited space for passengers’ legs. Due to the exit row located behind the seats of the 12th row are less reclining than standard. Missing windows make the seats 12A and 12F bad seats. Passengers of the 13th row will take advantage of extra legroom. These sears are considered the best seats. Thanks to missing seat in front the seat 14D offers extra legroom but has no floor storage. 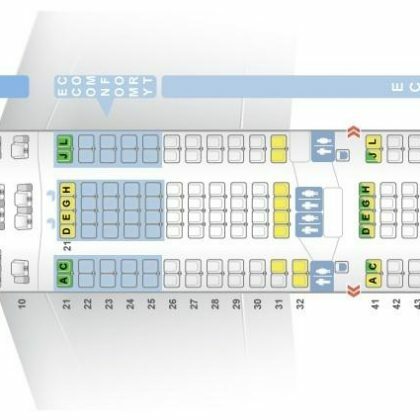 Economy class offers 143 standard seats that are divided into two sections. 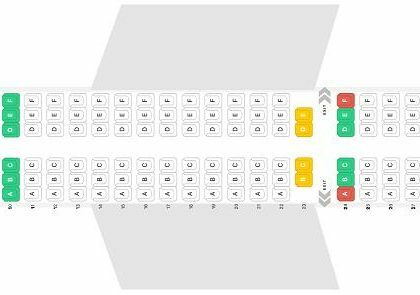 First section of economy class seats has 11 rows of seats: 10 of them have 3-3 configuration and the last row of the section offer 3 seats. The seat 19A is designated by Delta Airlines as preferred seat to reserve which passenger has to be a Delta Medallion member. For other passengers this seat becomes available at time of check-in. The window of this seat is misaligned. Proximity of the lavatory may represent problem for passengers of the seats 24ABC, 24D and 25D. Behind the exit row the second section of economy class seats is located. Due to exit row located in front the seats of the 26th row and the seat 27A offer extra legroom. These seats are designated as preferred seats that are reserved for Delta Medallion members and become available for other passengers at time of check-in. However, close location of the lavatory may be bothersome for passengers of the seats 26BC. The only disadvantage of the seat 38C is proximity of the galley. The noise from the galleys and lavatories located in the tail of the airplane make the seats 38DEF and 39ABC bad seats.